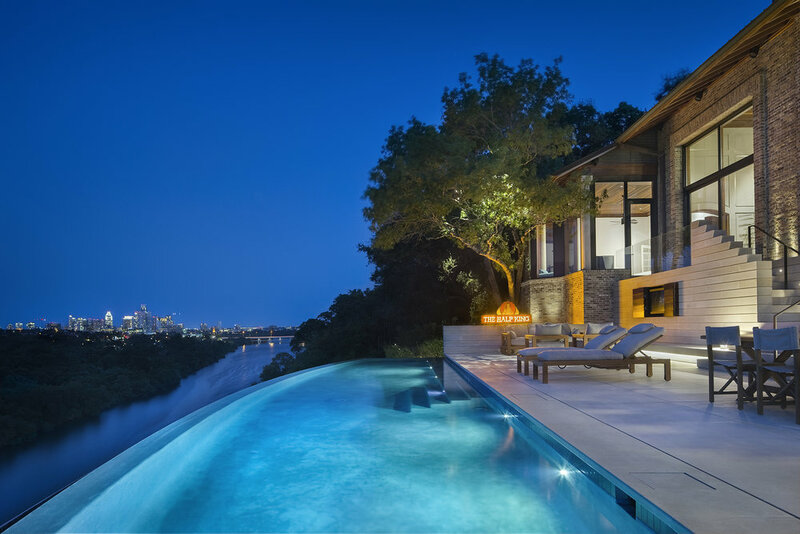 Situated atop a 140-foot tall limestone bluff, this West Austin residence boasts a commanding position on a promontory at the south side of Lady Bird Lake. Inspired by traditional Mexican haciendas, the existing home—designed in the 1980s by Hal Box, a former dean of the UT School of Architecture (1976-1992)—possessed a clear architectural identity. But when the home’s new owners approached the architects about a renovation, it became obvious that there was a disconnect between the home’s insular layout and its spectacular location. The main challenge of the renovation, which focused on the back deck and adjacent interior spaces, was to open up the home’s dark, heavy interiors to the outside. One-by-one, the architects addressed the obstacles presented by the existing design. The segmented windows facing the lake were supplanted by large expanses of uninterrupted glass. In the kitchen, dark wood cabinets and an extraneous brick arch were replaced with glossy white cabinets contrasted by soapstone countertops. Instantly recognized as a more suitable location for the master bedroom, the screen porch was enclosed with floor-to-ceiling windows that frame views of the State Capitol and UT Tower. Inspired by the limestone bluff upon which the home resides, a new pool deck acts as an extension of the topography, drawing the limestone up to form a sculptural pedestal for the existing brick façade. Composed of 7-inch tall horizontal stone bands, the deck bridges the two wings of the house, uniting the newly-remodeled interiors. The continuous stone bands are extruded to create steps, benches, counters, and even a TV cabinet before continuing down to a lower terrace with a curved glass rail. A series of smaller interventions was made in other spaces. A greenhouse and library were converted into a pair of bedrooms and bathrooms. Outside the master suite, a neglected patio was transformed into a Japanese garden. Finally, a detached guest bedroom with a sunken floor and high ceiling provided the ideal setting for a home theater.